Luxury Watches NYC is a family owned Watch Trading/ Brokering company which offers brand name watches at discounted prices. Our company is in business since 1998 and We have offices in heart of the New York City and Phoenix, Arizona. Our aim is to provide you a wonderful experience in hi-end watch trading, while maintaining great prices & exemplary customer service. We stand behind our products with up to a 3-year warranty on watches and a 30-day money back guarantee on every item. All of our products are Certified Pre-owned, professionally serviced and authentic. Case material: Steel; Charge: Automatic; Conditions: Excellent Presentation condition : With dealer guarantee ; Place: Usa, New York Model: Datejust $ 5465 LuxuryWatchesnyc Reference: 116263 Rolex Datejust Turn-O-Graph Two-Tone Men’s Watch with a Round 36mm Stainless Steel Case. 18K Yellow Gold Fluted Unidirectional Rotating Bezel. White Dial with Luminous Stick Hour Markers. Minute Markers around the Outer Rim. 18K Yellow Gold and Stainless Steel Oyster Bracelet. Water Resistant at 330 ft/ 100 m. Date display at 3 o’clock Position. Automatic Movement. Scratch Resistant Sapphire Crystal. Screw Down Crown. In very Good Condition. Minor Sign and Wear. No original box or paper. 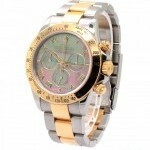 Comes with 2 Year Warranty from Luxury Watches NYC. Case material: Steel; Charge: Automatic; Conditions: Excellent Presentation condition : With dealer guarantee ; Place: Usa, New York Model: Link $ 995 LuxuryWatchesnyc Reference: Link Tag Heuer “Link” professional sport model, with silver dial and large unique polished applied Arabic numerals and markers, Swiss quartz movement, 200 meters water resistant. 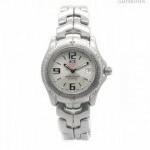 Stainless Steel head and bracelet with flip-lock, unidirectional rotating diver bezel, silver dial, quartz, date, screw-down crown, Ref. 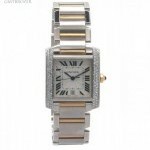 WT1212, 34mm, In very Good pre-owned Condition, minor sign and wear in both case & strap but overall in great condition. No original box and papers. 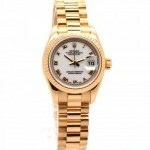 Includes 2 Year Luxury Watches NYC Corp. Warranty. Case material: Steel; Charge: Automatic; Conditions: Used Presentation condition : With dealer guarantee ; Place: Usa, New York Model: Datejust $ 3775 LuxuryWatchesnyc Reference: 68273 This is a pre-owned Rolex Mid-Size Datejust 68273. It has a 31mm Steel & Yellow Gold case, a Silver Jubilee Diamond dial, a Steel & Yellow Gold (Jubilee) bracelet, and is powered by an Automatic movement. 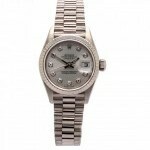 Case material: White gold; Charge: Automatic; Conditions: Good Year : 1999; Presentation condition : With boxes and all papers; Place: Usa, New York Model: Lady-Datejust Price on request LuxuryWatchesnyc Reference: 79179 Rolex Datejust Ladies Presidential Watch with a round 18K white gold case with 18k white gold fluted bezel. Silver dial with custom diamond hour markers. 18K white gold president bracelet with hidden deployment buckle. Sapphire Crystal. Date display at 3 o'clock position. Automatic Movement. In very good condition. Includes original box and paper. Comes with 2 year Warranty from Luxury Watches NYC. Case material: Yellow gold; Charge: Automatic; Conditions: Good Presentation condition : With dealer guarantee ; Place: Usa, New York Model: Submariner $ 14440 LuxuryWatchesnyc Reference: 16808 Rolex 18K Yellow Gold Submariner Wristwatch ref 16808. Early sapphire crystal model, 18K Yellow Gold 40mm case with heavy gold lugs and unidirectional elapsed time bezel.Black dial with black insert bezel. 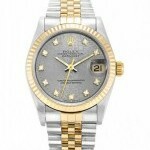 Rolex Automatic movement with quick set date. 18K yellow gold Signature Oyster bracelet with Fold over clasp. Wrist size 6.75″. No Original Papers but Box and booklets included. 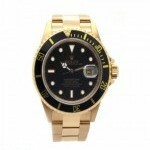 Comes with 2 Year Warranty from Luxury Watches NYC. 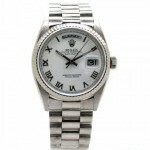 Case material: White gold; Charge: Automatic; Conditions: Excellent Presentation condition : With dealer guarantee ; Place: Usa, New York Model: Day Date / President $ 9645 LuxuryWatchesnyc Reference: 18039 Rolex Day-Date Men’s Presidential Watch with a round 36mm 18K White Gold Case with 18K White Gold Fluted Bezel. White Dial with Roman Numeral Hour Markers. 18K White Gold President Bracelet with Hidden Clasp. Screw Down Crown. Scratch Resistant Sapphire Crystal. Water Resistant at 100 m/ 330 ft. Date display at 3 o’clock position and day at 12 o’clock. Automatic Movement. In good condition. No original box or paper. 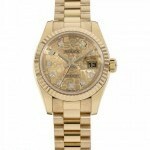 Comes with 2 Year Warranty from Luxury Watches NYC. Case material: Steel; Charge: Automatic; Conditions: Excellent Year : 2003; Presentation condition : With boxes and all papers; Place: Usa, New York Model: Daytona Cosmograph Price on request LuxuryWatchesnyc Reference: 116523 Rolex Cosmograph Daytona men's watch with a round 40mm stainless steel case with a fixed engraved tachymetric scale in 18K yellow gold bezel. Original black mother of pearl dial with roman numeral hour markers and subdials. 18K yellow gold and stainless steel oyster bracelet with folding oysterlock safety clasp. Screw down crown. Water resistant at 330 feet/ 100 Meter. Scratch resistant sapphire crystal. Mechanical chronograph self-winding Movement. In very good condition. Includes original box and paper. 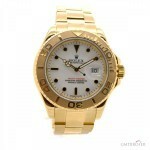 Comes with 2 Year Warranty from Luxury Watches NYC. Case material: Yellow gold; Charge: Automatic; Conditions: Never worn Presentation condition : With dealer guarantee ; Place: Usa, New York $ 16530 LuxuryWatchesnyc Reference: nessuna Certified Pre-Owned full size 18K Yellow Gold Rolex “Yachtmaster”. 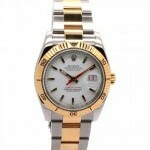 white Dial with ruby – cent Hours markers, Sweep Second Hand and Date Indicator. 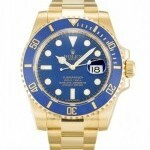 18K Yellow Gold Rotating Diver’s Bezel. Sapphire Crystal, Quick-set Movement. 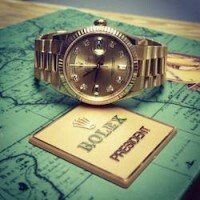 Matching 18K Yellow Gold Rolex “Oyster” Flip-lock Bracelet. Model Number: 16628 Case Diameter: 40mm. Wrist size 7″. In Mint condition, light sign and wear throughout, but nothing significant includes papers and box. Comes with 2 Year Luxury Watches NYC Corp. Warranty. Case material: Steel; Charge: Automatic; Conditions: Excellent Presentation condition : With dealer guarantee ; Place: Usa, New York Model: Tank Francaise $ 4876 LuxuryWatchesnyc Reference: W51005Q4 Cartier Tank Francaise 18kt Yellow Gold and Steel Unisex Watch W51005Q4. Stainless steel case with Stainless Steel and 18K yellow gold bracelet. Fixed Custom Diamond Stainless Steel Bezel. Silver grained dial with Roman numeral hour markers. Minute markers around an inner ring. Date display at the 6 o’clock position. Automatic movement. Cartier calibre 120 automatic movement engine. Scratch resistant sapphire crystal. 18kt yellow gold octagonal set with faceted crown. Solid case back. Case diameter: 36.5 mm x 28.15 mm. Rectangle case shape. Hidden deployment clasp. Water resistant at 30 meters / 100 feet. Functions: hour, minute, second, date. In very good condition. Minor scratches throughout the watch. No box or paper. Comes with 2 Year Warranty from Luxury Watches NYC. Case material: Yellow gold; Charge: Automatic; Conditions: New Presentation condition : With dealer guarantee ; Place: Usa, New York $ 6265 LuxuryWatchesnyc Reference: nessuna This is a women’s Rolex Datejust 18k Yellow Gold presidential Watch. Case 26mm. 18K Yellow Gold Case, Custom Diamond Champagne Dial and 18K Yellow Gold Bracelet. It is powered by an Automatic Movements.